A good friend of mine just graduated from law school at UVA and will shortly be moving back to New Hampshire, where she grew up, to take a clerkship. She's been following my Mt. Washington "training" since it was just a pipe dream a few years ago. 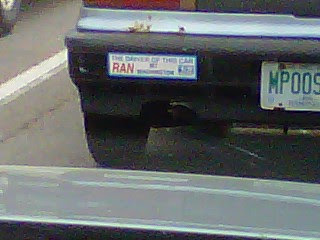 In case you can't make it out, that's a bumper sticker reading: "The driver of this car RAN up Mt. Washington." It's a clever play on the bumper stickers that read: "This car climbed Mt. Washington." Well, well, well... that text message was followed the next day by another: "When is the Mt. Washington lottery? Should I enter for next year?" Yes! Yes! The Mt. Washington lottery allows you to enter as an all-or-nothing group. They swear that it doesn't decrease your chances, but if one member of your group gets in, you all do. So we'll be a group in next year's lottery. This sounds like torture! I admire people that put themselves through this, but there's no way I have the courage to do the same myself. I bet a few of my running buddies would be all over this though!